With two rounds of the Candidates to go World Champion Magnus Carlsen has produced a new YouTube video giving his thoughts on who his next challenger will be and on the tournament in general. 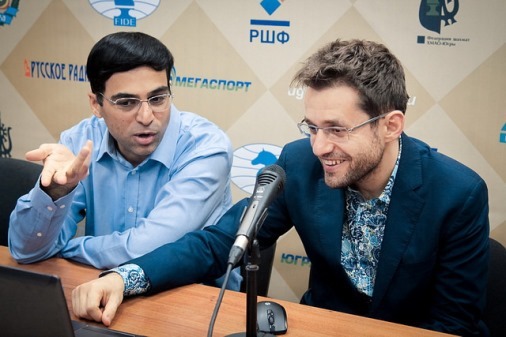 He responds to Vladimir Kramnik's comments about people blundering against him, notes Vishy Anand has been the only stable player and admits he was wrong to write off Sergey Karjakin. A lot has happened and there have been a lot of turnarounds and dramatic events, but really only one player has remained stable and continued to play good chess, and that’s been Anand. Last time after six rounds Anand was leading by half a point over Aronian. Aronian caught up with him the next game, then he was White against Anand and played kind of a strange opening, was lucky not to get worse and made a draw. Then the very next round Aronian played a very interesting opening against Mamedyarov and then he gradually went astray and lost while Anand beat Topalov. Since then it’s been all draws for the two of them, so Anand is leading by one point and holds the tiebreaker over Aronian after twelve rounds, while Karjakin is one and a half points behind and he’s playing Anand with White in the very next round. So he’s really the only guy with a little bit of a chance, but I think the way Anand’s playing he’s pretty confident that he can hold with Black there. My general impression is that most of them are just a tiny bit desperate. I don’t think you need to go into a street fight to win every game. I read something Kramnik said about, “well, I’m not Carlsen, so I can’t win every equal endgame – they don’t blunder like that against me”. That might be true… but it does sound a little bit like an excuse. But anyway I think at some point some of them would be better suited to play more like Anand has been playing in the tournament, more pragmatically – just taking what’s there. It feels like several of the players have been trying hard to gain the initiative and when something goes wrong they don’t defend very well, and I think that’s been a little bit disappointing – the level of tenacity in their games. We’ve still got two rounds to go. As I said Karjakin has a chance to catch up with Anand. He really turned it around in the second half. I said last time I didn’t believe he would turn it around – one of the few things I was wrong about. 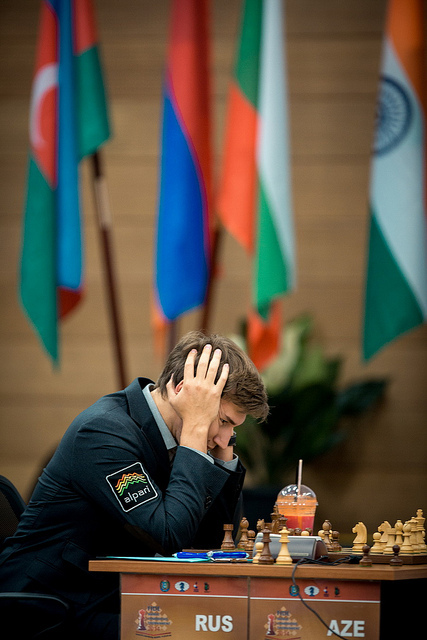 He lost one more game, to Aronian – a really nice game by Aronian, by the way – and then it looked like he was out of it but he beat Svidler in a game where Svidler made some mistakes in a drawish position, but Karjakin also showed some very good technique by sacrificing the exchange – which was very nice. Then he beat Kramnik. 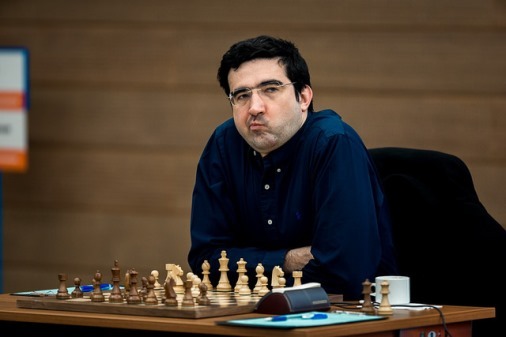 I think Kramnik’s maybe gotten too much stick for his mistake in the opening there. I don’t know exactly what he missed but the idea that he went for with 7...dxc4 (see diagram) 8.Qxb7 and 9...Nd5 and maybe to go Nb4 later on does look tempting. Of course the computer gives a white advantage immediately, but I don’t think it’s as obvious as some people have been trying to put it. Karjakin had winning chances against Topalov with Black after Topalov was one of those who I think didn’t really play according to the demands of the position or tenaciously enough after he didn’t find a way to win. He kind of just dropped his level of play a bit, but [Karjakin] couldn’t find a way to win. Also yesterday against Mamedyarov he had excellent winning chances after he defended very well in serious time trouble but he couldn’t make anything of it. I think if Karjakin had won one of those he would be one point behind and he could effectively win the tournament by beating Anand tomorrow. Now I’m not so optimistic on his behalf. I think Anand is just going to hold and win the whole thing. So overall it’s been an exciting tournament. The quality has been a bit up and down. I think it really shows in the games of the players that only first place counts, but as I said, that’s no reason to defend poorly and play too desperately. I think you need to find a middle ground – find a balance. There’s one player who’s managed to do that so far – Anand. That’s why I think he’s going to win. So, I think we’re done for now. I’m ready to eat my words once again if Anand does lose against Karjakin and something exciting happens in the last round. We’ll see! Don't miss our live Round 13 broadcast here on chess24!